It's curious that something as American as cooking outdoors in the summer lends itself so well to a diversion so Continental as what the French call l'heure de l'apéritif (roughly: the time for pre-dinner drinks). Nevertheless, a cooling and aromatic drink is just the thing for slaving over a hot barbecue at that hour. And few libations fill the bill like the currently fashionable Negroni. While cocktails are an American invention of the nineteenth century, this drink is an Italian import from the 1920s. Until recently it didn't get a lot of notice in the ongoing cocktail rebirth—and truthfully it had been snubbed a bit beforehand. (Both The Savoy Cocktail Book, of 1930, and David A. Embury's The Fine Art of Mixing Drinks, of mid-century, didn't even mention the Negroni.) Suddenly it's in vogue again, and even has an official Negroni Week (celebrated in early June this year). A mix of equal parts bitter aperitif (typically Campari), sweet vermouth and gin, served over ice in an old-fashioned glass with an orange slice, it is actually the descendant of another drink. The Americano is a blend of the first two ingredients with a possible topper of soda water. Before you get all puffed up with national pride over that name, consider that it may have been so titled for its tarter component (amaro being the Italian word for bitter)—if not to recognize the American tourists and doughboys who enjoyed it. James Bond enthusiasts will recognize the Americano as the first drink the spy orders in the first book of the 007 series, Casino Royale. 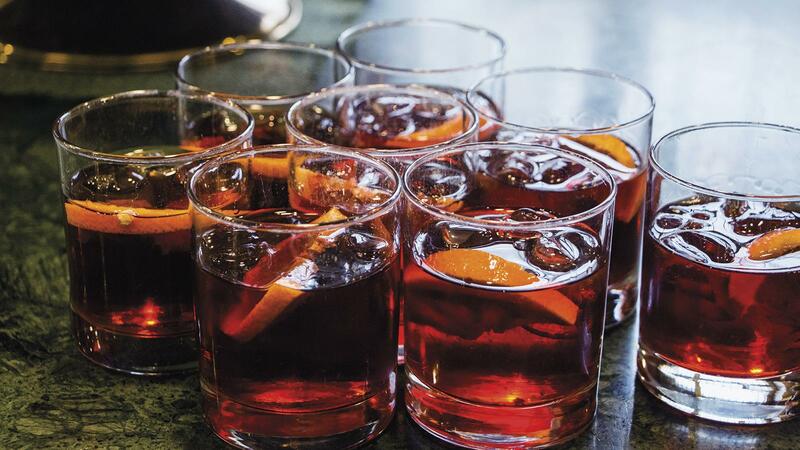 The Negroni got its name from the Italian Count Camillo Negroni, who supposedly asked his server, Fosco Scarselli, at a bar in Florence for a version of the weak Americano that had a little more giddyup. The barman complied by fortifying it with gin. The rest would be history except that the Negroni has spawned other like drinks. The most famous is the Boulevardier, first made by Erskine Gwynne, an American expat in Paris in the late 1920s. He replaced the gin with whiskey. (Typically that component is rye or Bourbon and poured a little stronger than the other two.) A Cognac version now exists (Negroni Française) and I've had success by swapping in peaty Scotch. For it's part, Campari's own Cocktail Compendium lists a slew of variations, including those with rum, vodka, tequila, mescal and even a prosecco-informed version. Ultimately, the point is a mix of the two aperitifs with a not-overpowering infusion of a spirit that is easy to make and conjures the consummate refresher.